I’m on a team that recently decided to patch a client environment, upgrading Hyperion Planning 11.1.2.3 from the .501 patch to the .700 patch. We quickly started having deployment issues related to unknown members in member formulas. This was with a “classic” Hyperion Planning application, not an EPMA app. 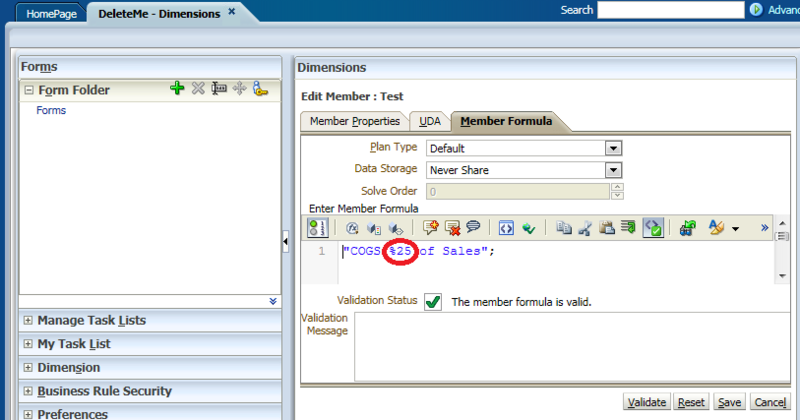 Upon validating (or saving) the formula, an error was introduced. Interestingly, the validation returned with a “successful” message. The number 25 was appended to the “%”. Subsequent validations added another “25”. The application repository was clean – formulas there were correct. LCM exports also looked good. But saving formulas suddenly got risky. This application had some very, very complex member formulas. Read the Readme file! It details known issues and fixes addressed by the patch. Patch a Development or Sandbox environment first. If you have apps in Production, make sure you plan for a thorough regression test.